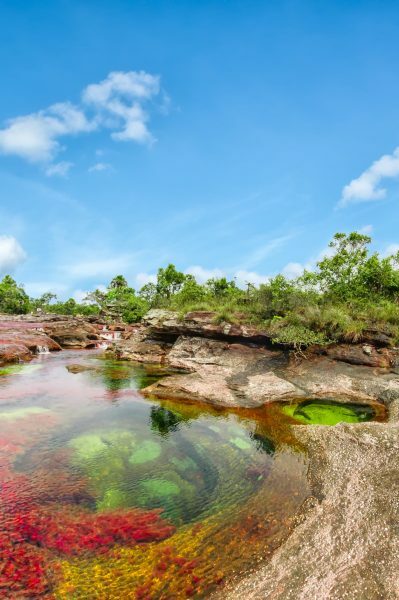 Known popularly as the “Liquid Rainbow”, Caño Cristales (“Crystal Channel”) is a 100km-long river located in the Serrania de la Macarena province of Meta, Colombia. From late-July to November, the river gleams in various colours, from yellow, green, blue, black and the especially vivid red. The colors form naturally in this river in Columbia. Crazy how beautiful nature can be all on its own. Its multi-coloured majesty is attributed to the endemic riverbed plant known as the macarenia clavigera, which thrives here thanks to the river’s precise temperature and sunlight conditions. The the river is extremely clear due to the lack of nutrients and small particles flowing in from the Guayabero River. Arranged tours are required for travellers to reach Caño Cristales. 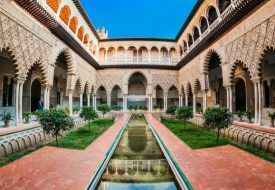 The journey will take you to the local airport in Serrania de la Macarena, from which motorised boats will whisk you down the Guayabero River. Get off at any of three hiking trails, and head to Caño Cristales by foot.